From time to time, you can see chess games here played by computers. A few of my readers have complained about this. "I'm not interested in chess games", they say. I can imagine chess games are not everybody's cup of tea. But with one of the largest collections of chess computers on the Internet, it would be silly never to write about them. When asked what they would like to see instead, I heard someone say he would like to see what a chess computer looks like on the inside. 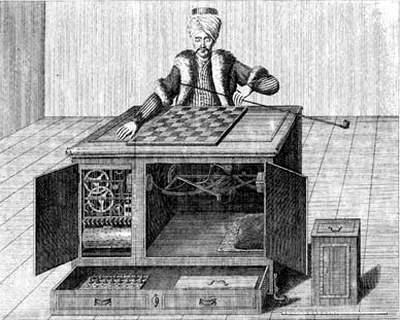 But the person who said this, may have imagined a kind of 'computer' like the 18th century conjuring trick called The Turk, whose inside was specially designed to impress the spectators. The innards of present-day chess computers don't, however, look very exciting. The lonely metal disk on the lid is a loudspeaker. On the right there is a black wheel, which is used to adjust the contrast of the screen. And on the far side of the computer, you can see the "stylus", the pen with which the screen can be pressed. the "ACL switch", a thin metal disc which can be pushed with a paperclip or so through a hole in the lid. It is used to reset the computer. 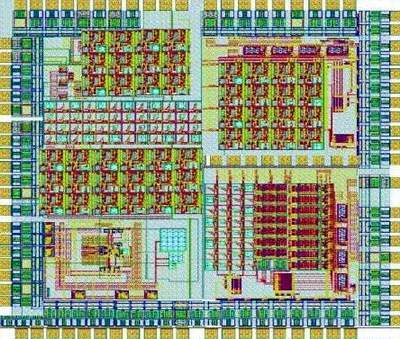 a 'crystal', the part of the clock that determines how fast it 'ticks'. Once the board has been unscrewed, it can be turned around. We can see that the processor -- like a spider in its web -- controls about a hundred wires. Unfortunately, the processor itself is invisible, since the manufacturer has covered it with some black material. You may have expected to find out how chess computers work. Unlike bicycles, pencil sharpeners and clocks, the innards of a chess computer do not really disclose how the computer works.